A crewless U.S. Navy blimp, L-8 floats aimlessly over Daly City, Calif.
L-8’s two-man crew boarded the gondola shortly before takeoff. Lieutenant Ernest Dewitt Cody and Ensign Charles Ellis Adams were both Navy veterans, married and with exemplary service records. Cody, the senior aviator of Airship Patrol Squadron 32, was a 1938 graduate of Annapolis. He would be remembered as taciturn by nature, not one to lose his head under pressure. In fact, his commanding officer considered him “one of the most capable pilots and one of the most able officers” under his command. Nonetheless, Cody was a latecomer to lighter-than-air (LTA) flight. He hadn’t been designated a naval airship aviator until December 1941, which meant he’d been officially flying for just nine months. Only 27 years old when he arrived at Moffett Field in February 1942 as a lieutenant junior grade, Cody sported a mustache, most likely in an effort to appear older. Although technically senior to his passenger, Cody was 11 years younger than Adams and significantly less experienced. In fact the blimp’s pilot had only 756 hours of LTA flight time, while Adams had 2,281 hours. But the lieutenant did have one notable achievement under his belt: In April 1942, he’d flown L-8 to deliver precious cargo to USS Hornet (CV-8) before the ship departed for Doolittle’s Raid over Tokyo. Cody had held L-8 steady over the carrier’s bobbing flight deck while 300 pounds of spare parts were lowered for the B-25 bombers that would be used in the attack. That maneuver, which required a fair degree of piloting skill, contributed to his being promoted to lieutenant senior grade two months later. Ensign Adams had 20 years in LTA craft. A veteran of the Navy’s giant rigid airship program, he’d served aboard Los Angeles (ZR-3), Akron (ZRS-4) and Macon (ZRS-5). The 38-year-old crewman had even been decorated by the German government for rescuing Hindenburg passengers after the airship caught fire and crashed. Though Adams was more experienced in airships than Cody, he’d only received his commission the day before their August 16 flight. In other words, he was making his first LTA patrol as an officer. Flight 101 was scheduled to fly to the Farallon Islands, 30 miles west of San Francisco, then head north to Point Reyes and south to Montara Beach before returning to Treasure Island. The patrol would take four hours, with Lt. Cody and Ensign Adams expected to return to base sometime between 10 and 10:30 that morning. The flight started out routine in every way. Airship Patrol Squadron 32 was the first LTA unit to be established on the West Coast after Japan’s attack on Pearl Harbor. Originally part of Goodyear’s fleet of advertising blimps, L-8 had been purchased by the Navy, shipped to Moffett Field for assembly and commissioned on March 5, 1942. Love-8, as the craft was also called, was a 150-foot-long blimp similar to the type Goodyear flies over athletic events today. Held aloft by 123,000 cubic feet of helium, the blimp had a maximum diameter of 47 feet and a cruising speed of 43 knots. It was powered by twin 145-hp Warner Super-Scarab type 5 engines. The airship had a reputation as an excellent flier. In fact, during its 1,092 trips aloft it had required no more than the usual maintenance and repair. Inspected four days prior to Cody and Adams’ departure, L-8 was deemed to be in fine working condition. At 6:03 a.m. Love-8 lifted off from Treasure Island with Cody at the controls. Winds were light and variable at 4 knots per hour, with a ceiling of 800 to 1,000 feet. The day was slightly overcast, but visibility was good at three to five miles. Cody could even see the towers of the Golden Gate Bridge in the distance. L-8’s mission was to patrol within a 50-mile radius of San Francisco; once Cody passed over the Golden Gate, he headed southwest, toward the Farrallon Islands. At 7:38 a.m., an hour and a half into the patrol, he radioed L-8’s position as four miles east of the Farallons. Four minutes later he sent a second message, “Am investigating suspicious oil slick—stand by.” An oil slick could indicate an enemy sub lurking below the waves, so it’s not surprising that L-8 dropped two Mark IV float-lights (a smoke-producing flare shaped like an aerial bomb) at 7:42 a.m. and began scrutinizing the area. When the Liberty ship Albert Gallatin spotted L-8’s smoke flares, its crew sounded the general alarm and manned its guns. Sailors from the nearby fishing trawler Daisy Gray, worried that the blimp was about to depth-charge an enemy sub, pulled in its nets. But no bombs were dropped. Instead, L-8 circled the area for more than an hour. The blimp was close enough to Daisy Gray that the trawler’s first mate could make out two men in the gondola, one of them with dark hair. Though L-8’s identification had been removed from its outer envelope, it was still painted on the control cabin. Besides, there was no mistaking a blimp of this type. As Daisy Gray’s and Gallatin’s crews watched through binoculars, the blimp circled at 200 to 300 feet, at one point descending to 30 feet above the waves, as if its crew wanted a closer look at something. Then shortly after 9 a.m., Love-8 dropped ballast, rose and headed back toward San Francisco. Since blimps regularly patrolled the California coast, nobody thought L-8’s movements seemed unusual. But that was the last time Cody and Adams were ever seen or heard from. L-8 had broadcast its last message at 7:42 before circling the oil slick. After that, Wing Control tried to reestablish radio contact, without success. Squadron headquarters wasn’t told of the blimp’s radio silence until 8:20, but it wasn’t unusual for blimps to lose contact during a patrol. Besides, Cody and Adams had more than enough fuel to return to base. But when L-8 still hadn’t responded by 8:50, two Vought OS2U Kingfisher floatplanes were sent to search for the blimp. Other aircraft in the area were also alerted to be on the lookout. 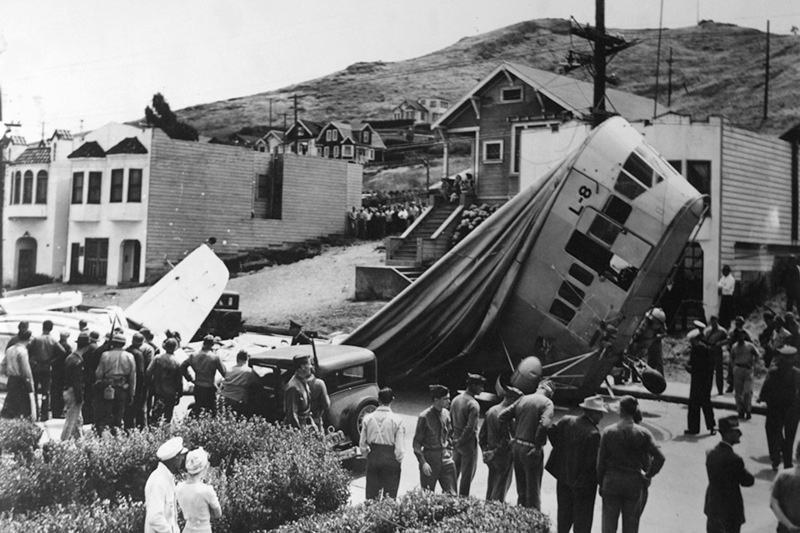 The next indication of L-8’s whereabouts came at 10:49, when a Pan American Clipper pilot reported seeing the blimp over the Golden Gate Bridge. He spotted nothing wrong with the ship, which appeared to be under control and heading back to base. At 11 one of the Kingfishers reported seeing L-8 three miles west of Salada Beach, rising through the overcast at 2,000 feet. A few minutes later the blimp began to descend, disappearing in the clouds. Nothing indicated that L-8 was not in controlled flight, but 2,000 feet was close to the blimp’s pressure height, the altitude where its valves would automatically open and vent helium, to prevent its gas cells from bursting. Normally, the crewmen would have avoided surpassing pressure height, but for some reason they had apparently ignored this restriction. Next to sight L-8 was an Army P-38 pilot, who spotted the blimp near Mile Rock. He noticed nothing amiss, assuming it was headed to Treasure Island. A few minutes later Richard Quam, an off-duty seaman heading for a day at the beach, was driving along the coastal highway between San Mateo and San Francisco when he spotted L-8 in the distance and noted that the blimp was bent in the middle. Quam stopped to snap a photograph; his film would soon be confiscated by the authorities. At approximately 11:15 a.m., five hours after L-8 left Treasure Island, the blimp approached the shore at Ocean Beach in San Francisco, about a mile south of Fort Funston. A solitary bather noticed the blimp hanging 50 feet offshore, its motors silent. L-8’s bag was sagging noticeably as it moved broadside to the wind, only 50 feet above the water. The blimp touched down briefly on the beach, then moved inland until its gondola hit the side of a hill, packing the starboard engine with dirt and leaves and bending its propellers. The blow also knocked one of the depth charges loose, which rolled downhill before coming to a stop. Suddenly free of 325 pounds, L-8 then rose, cleared the embankment and disappeared from sight. L-8 then descended toward Daly City, a suburb two blocks south of San Francisco’s county line, striking the roofs of several homes. Ethel Appleton heard the blimp’s drag line scrape across her rooftop and instinctively grabbed her 8-year-old daughter, concerned for their safety. When Richard L. Johnston, who was polishing his car in front of his house, noticed the partially deflated blimp overhead, he rushed to protect his mother. At 11:30 a.m. L-8 came to rest in the middle of the 400 block of Bellevue Avenue. “You couldn’t have lifted it down any easier than it dropped on Bellevue,” said Deputy Marshal Sean Wood of Daly City’s Fire Department. The blimp’s cabin actually nosed into a utility pole in front of the Johnston home, breaking off the cross arm. The force of the collision swung the blimp’s tail into the electrical wires, sending a shower of sparks to the ground. Fortunately, L-8’s fuel supply didn’t ignite, but the blimp’s envelope was punctured, and the airship slid to the ground tail first, slowly deflating atop Johnston’s freshly waxed car. One of the first people on the scene was William Morris, a volunteer fireman who lived next-door to Johnston. “It was a miracle she didn’t catch fire when she struck those telephone wires,” Morris commented. As it was, Love-8 dented the hood of Morris’ 1928 Dodge sedan and bent its headlight. Morris rushed to aid the blimp’s crew as sirens blared and the air filled with escaping helium. But when the fireman peered inside the gondola, he was surprised to find that “The door was open and nobody was in the cabin.” Daly City fireman Thomas O’Brien also found the gondola empty, but noticed that the door to the cabin was latched open and the microphone for the Bogen Hailer, a loudspeaker system used to communicate with surface ships, was dangling outside the doorway. Firemen soon surrounded the blimp, slashing its envelope in an effort to free the crew they thought must be trapped inside. They saw no sign of Cody or Adams. As a precaution, authorities set up a perimeter around the crash site and firemen lashed the remaining depth bomb to the gondola. Later that day, 40 men from NAS Moffett Field and another 50 from a nearby Army post set out to locate the missing depth charge. They had retrieved it by 3 p.m. Unfortunately, Cody and Adams were still nowhere to be found. An inspection soon revealed that all three of L-8’s parachutes were still on board, along with its single life raft. Two of the blimp’s five smoke bombs were missing, but those were accounted for because the crew had used them to mark the oil slick. A briefcase containing classified material was found behind the pilot’s seat. L-8’s engines were in perfect working order. The ignition switches were on, and the blimp’s instruments and flight controls operated normally, with four hours of gas remaining in the fuel tanks. In other words, there was nothing whatsoever wrong with L-8 except that it lacked a crew. True, two of the three life jackets carried on board were missing, but regulations required Cody and Ensign Adams to wear lifejackets while patrolling over water. It’s not surprising they would disappear along with the men. The only thing slightly strange was that the blimp’s batteries were drained and part of its fuel supply had been dumped. Normally, a blimp wouldn’t dump fuel unless it needed to increase buoyancy in a hurry. Since L-8 didn’t seem to have that need, it wasn’t clear why fuel had been lost and its engines idled. The U.S. Navy immediately launched an extensive search for the two missing men. Air raid wardens and San Mateo County highway patrolmen spent the night combing the area where L-8 had drifted ashore. For the next three days, Navy ships and planes assisted by the Coast Guard searched the Pacific. But despite calm seas and good visibility, there was still no sign of Cody and Adams. The Navy notified the men’s wives they were officially listed as missing. Despite calling 35 witnesses, the inquiry could find no answers to the most basic questions: Why did Cody and Adams stop broadcasting if their radio was working? What caused the two men to leave their airship in mid-flight? And what happened between the time they spotted the oil slick off the Farallons at 7:42 a.m. and the point when L-8 came ashore at Ocean Beach around 11:15 a.m.? Theories abound as to why Cody and Adams vanished: They were captured by a Japanese sub; they were spying for Japan and rendezvoused with an I-boat to escape; a stowaway had overpowered the two men and then somehow vanished as well; their disappearance was an AWOL scheme gone awry; one crewman murdered the other over a woman, dumped his body, then fell overboard himself; a rogue wave swept both men away; and L-8 had temporarily dipped into the ocean, washing away both men. The perennial favorite, of course, is that Cody and Adams were abducted by aliens. Most puzzling to investigators was why L-8’s crew failed to broadcast a radio message after sighting the oil slick at 7:42 a.m. And if one of the crew had fallen from the cabin while investigating the oil slick, why didn’t the other man radio for help? If both men were still on board when L-8 headed back to San Francisco around 9 a.m., what led to their disappearance later? Otto Gross, who has been researching the disappearance of L-8’s crew since 2009, believes he’s found the answer. Gross’ theory, detailed at his website ghostblimp.com, is that the blimp had been secretly testing experimental radar, and poorly shielded microwaves overpowered the men, causing them to tumble out of the cabin. Gross’ claim is speculative, however, since no hard proof has ever been uncovered that L-8 was testing experimental equipment on the doomed flight. The simplest explanation is that both men left the airship not long after their last broadcast. Most likely one fell overboard while surveying the oil slick or possibly fixing the engine. That would account for the two smoke bombs being dropped, the ship descending to 30 feet and the use of the Bogen Hailer found dangling from the gondola, presumably to communicate with the man overboard. As the findings from the naval inquiry suggest, there may also have been issues with the safety latch on L-8’s door: Doubts as to fastening of the safety lock at take off and adequacy of the latch suggest the possibility that the latch might have been released accidentally permitting the passenger to fall out…failure to use the radio or the life raft might indicate that the pilot hoped to recover his passenger very quickly. The fact that both engines were stopped might be explained by the pilot’s attempt to slow the airship while heading into a very light breeze. The open door latched full forward, the microphone and radio head set hanging out the door lend credence to this theory. In such an attempt the pilot might himself have gone overboard…no other adequate explanation offers itself for the abandonment of an airworthy airship. L-8 was quickly repaired and resumed duty as a training vessel. When World War II ended, the Navy returned the blimp to the Goodyear Tire & Rubber Company, which refurbished its cabin and renamed the craft America. The blimp traveled around the nation televising sporting events from 1969 until 1982, when it was retired. In 2003 Goodyear donated the control car to the Naval Aviation Museum in Pensacola, Fla., where it was restored. It is now on display in the same configuration and markings it had in August 1942. A year after Cody and Adams went missing, they were legally declared dead. The Navy closed the book on the incident, officially classifying it as “100% Unknown/ Undetermined.” Nevertheless, the mystery of L-8—the LTA version of the enigma surrounding Mary Celeste, a British ship discovered floating unmanned in the Atlantic in 1872—still fascinates us today. Numerous websites are dedicated to the incident, and a 1993 episode of the TV show Unsolved Mystery also focused on the crew’s disappearance. The truth is, we’ll probably never know what really happened to Cody and Adams. It’s unlikely their bodies will ever be found. In other words, the L-8 story contains all the elements of an enduring mystery: Two men simply vanished. John J. Geoghegan is the author is the author of Operation Storm and the executive director of the SILOE Research Institute in Woodside, Calif.
Mystery of the Ghost Blimp originally appeared in the November 2014 issue of Aviation History Magazine. Subscribe today!